Reshape your garage with custom-tooled storage! Available only at The Container Store, our exclusive Platinum Elfa Utility Garage Storage space features Ventilated Shelves for storing items of varying sizes, Melamine Shelves for a stable work surface and smooth-gliding drawers for smaller things. Plus, there are a host of Elfa Utility Hooks and Holders to get those hard-to-store items up off the floor. All Elfa components are adjustable, so the solution is completely flexible! This solution is designed for a wall at least 6' wide If this won't work for your space, please contact us so we can design the perfect solution for you with our free service! how much weight in pounds can an elfa garage shelf hold? How much weight can I place on an entire elfa garage wall system as in paint cans, fertilizer bags, etx. When installed properly (into studs where possible and using our wall anchors where studs aren't present), our elfa solutions can support up to 75 pounds per linear foot. 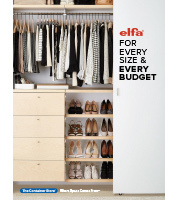 Is everything that is in this video included in the Elfa Utility Platinum Garage Storage? A complete listing of the included components for our elfa utility Garage Storage solution can be found just under the Product Information copy. How can you order shelving cut to a specific size online? Our elfa Ventilated Shelves, Hang Standards, Top Tracks, and Closet Rods can be custom cut on the shopping cart page using the &quot;Need it cut?&quot; button on the left side. You can also contact us and our elfa designers will create a custom design just for you. What is the minimum wall height required so that the bottom baskets do not touch the floor? I want to install the platinum elfa utility garage storage solution in a garage/basement in an area where the maximum height from the floor to the underside of the floor joist is 91.0 inches. Given this constraint, would I have enough room to install the system so that the bottom baskets do not drag on the floor? Our elfa utility Garage Storage solution is designed so that the Top Track is mounted a 84&quot; - plenty of room given the constraints of space you describe. For assistance from one of expert space planners, contact us at 1-888-CONTAIN (266-8246).